The new affordable quad-core tablet is now official! Cherry Mobile announced their new tablet called "Cherry Mobile Fusion Wave," with its Exynos-powered quad-core processor with Mali-400 GPU. 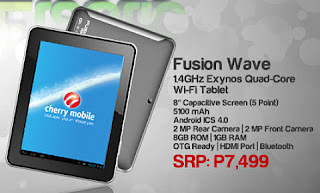 Cherry Mobile Fusion Wave is powered by Android 4.0 (ice cream sandwich) and 8 inch capacitive screen display. This tablet will last for a long hours because of its 5,100 mAh battery. For other features, please view it below. For the meantime, If you feel that this details are informative, please bookmark it now or visit this site more often for you to be updated. You may also share this post to your friends so they may know about Cherry Mobile Fusion Wave. Comments or suggestions about "Cherry Mobile Fusion Wave Quad Core Tablet at Php7,499" is important to us, you may share it by using the comment box below.